still appears a surprisingly melodramatic and immature production for a young woman who had seen four years of War service and three of University training. It stumbled towards a technique which I have since repeated with possibly better results – the relation of an individual story against a larger background of political and social events – but the story was over-emphasized and the background lamentably inaccurate and incomplete. Yet, by the time I began the book, I was well into my twenties; I had passed through a veritable lifetime of annihilating experience; and I was not, I think, exceptionally unintelligent. Virginia waited for the torrent to subside a little. ‘No,’ she said very firmly. Sylvester, white and trembling, looked at her with blazing eyes. He seized both her hands as he spoke, pulled her out of her chair, and began to draw her towards him. With a tremendous effort she managed to get one of her hands free – the one in which she still held her paper. [Oh yes, this is all during what is supposed to be a “coaching” session.] Summoning all her strength she lifted it above her head, and struck him violently with it in the face. He let her go immediately and staggered back, with eyes watering and one cheek crimson from the blow. Yeesh, right? And yet fending him off with her paper is surely symbolic of the deeper contest between the feminine submission he wants (in the guise of romance) and her determination to achieve things with her life that she believes (as Brittain believed) were likely incompatible with marriage. He’s a sexual bully as well as the incarnation of masculine privilege in a context marked by women’s aspiration to claim their share of the authority that comes with education and the degrees that formally recognize it. If only the novel continued to beat him up; if only he had to pay, not just for his violence against Daphne, but for his regressive attitudes and his sheer, unmitigated meanness — and by that I mean, for things like being angry at Daphne for fainting during an ‘at home’ he insists on her hosting at short notice even though she is heavily pregnant and generally unwell and unhappy. If only Daphne had grabbed the poker during the miserable confrontation and struck him down, instead of being struck down herself … or if only Daphne and Virginia had united against him and formed the kind of genuinely mutual friendship Brittain and Holtby had, settling in together to raise Jack into a different kind of man than his father (in the true Bronte tradition, crippling him at birth would have been a helpful step in that direction). No, it’s for the weak and the wicked and the undeserving that we have to give things up. Look at the lives of people like doctors and nurses; more than half their days are spent on patients whose diseases are due to their own sins and follies. Look at the teachers of boys and girls in schools; they don’t wear out their gifts and their energy on the brilliant and the ambitious, who’d get along all right without any teachers at all. No; they give their best work to the lazy and the backward and the stupid, who either can’t or won’t learn. Just in the same way the clergyman in a slum parish spends al his time and thought on the people who drink and swear, and beat their wives, or are unfaithful to their husbands. . . . You’re one of them now, Daphne, one of the children of the Kingdom, who because they save others lose the chance to save themselves. Yeesh again, I’m afraid, first of all because this long speech really comes out of nowhere. I wouldn’t declare absolutely that no character ought to speak for three pages straight, even didactically: there might be a right time and place for it, a right novel, the right novelist. But surely the speech ought to feel organically part of the novel, something that everything else in the novel has prepared us to hear, and if The Dark Tide is about the beauty of self-sacrifice on behalf of the wicked and undeserving, this is the first we’ve seen of it. It seems telling that Daphne’s not convinced, also – but I don’t sense that Brittain is using the gap between Virginia’s conviction and Daphne’s disappointment to do anything in particular except continue distinguishing between them as characters, at Daphne’s expense as usual. The sudden introduction of what seems a new theme, and the intrusive and inartistic way it is handled are both reasons to object to this part of the novel. An equally good, if not better, reason is that the doctrine is so ethically problematic. If the better are always to serve the needs and interests of the worst, doesn’t that mean that in the end, the wicked win? What’s the long-term good of self-sacrifice that serves only to prop up someone like Raymond? It’s enabling, that’s what it is! It’s exalting within limits, perhaps, and it may even be theoretically necessary, because if you put your own needs first, you blur the line between yourself and the undeserving. But it lets the bad guys win. George Eliot is uneasy about this too: think of Lydgate, whose better nature makes him tend to Rosamond at the cost of his own highest aspirations. What’s sad there is that precisely because he is the better person, he has no real choice. The same is true of Dorothea’s promise to Casaubon: she has to say yes, or she wouldn’t be Dorothea. It’s her best self that leads her to the brink of a sacrifice we all (including her) know he does not deserve. Eliot rescues Dorothea by killing off Casaubon, saving us all from the misery of watching Dorothea live out the consequences of her own moral elevation. The novel in which she does that would be utterly disheartening. If Viriginia is speaking for Brittain in The Dark Tide, she seems quite prepared to inflict such a doctrine on her character, but it’s impossible to believe Brittain would have accepted such terms for Holtby in real life. Overall, it’s a strange, puzzling, annoying, unsatisfying novel. What it is not, on my reading, is what Bostridge calls it: “an amusing period piece.” It’s far too dark for that. Brittain quotes a contemporary review of it that concludes “Some day she may write a good book.” That seems fair. 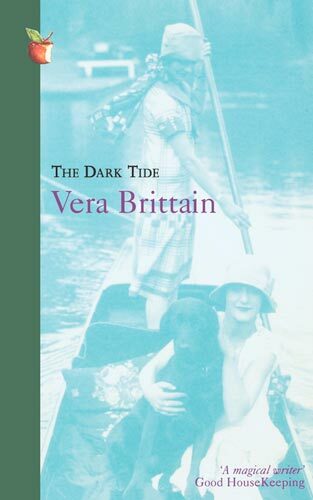 A Dark Tide is not a good book, but there’s something about it (including quite a powerful section about Daphne’s growing isolation and self-awareness in the early weeks of her marriage) that tells us the writer has a good book in her. Previous Article My tremendous writings — not! Sadly, the book is so melodramatic that it would be hard to take it seriously. Brittain always wanted to be known for her fiction rather than her nonfiction and I think was a bit jealous of Holtby’s skill as a novelist. _Honourable Estate_ was better, but it angered Brittain’s husband, as she used the life of his mother for one of the characters, and the relationship between Ruth and the American Eugene Meury is clearly wish fulfillment on Brittain’s part, vis a vis her unconsummated relationship with Roland Leighton and her attraction to her U.S. publisher, George Brett. Thanks for that further context, Elizabeth. I don’t know if I’d want to rule out taking the book seriously – in fact, I guess I’d say I already had a go at taking it seriously, despite the melodrama. I’d never rate it highly for its literary merit, though! But anyone who loves, say, Mary Barton – as I do – can hardly proclaim melodrama a fatal flaw. As a writer, I have to ask: if it’s “bad” but still interesting–and if it required effort and craftsmanship–doesn’t that steer it back toward the territory of art?